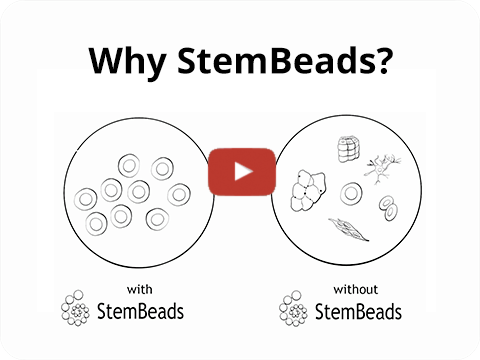 StemCultures is led by a team of dedicated cell biologists, industry technologists, and entrepreneurs who are committed to working together to advance life science research. We create, manufacture and distribute reliable reagents that improve the experience of scientists with diverse interests and fields. Our proprietary controlled-release reagents provide a stable micro-environment for improved cell growth. StemCultures is in partnership with the Neural Stem Cell Institute which possesses decades of research experience, including the lab of Dr. Sally Temple, co-founder of StemCultures, a pioneer credited with discovering stem like cells in the brain in 1989. I used the Stem Culture FGF2 beads on both a normal line and Swachman-Diamond Syndrome line of human iPS cells in my media over the weekend. I added iPS media with the Stem Culture FGF2 beads substituting for the FGF in my typical media on Friday, and by Monday my cultures still looked remarkably healthy. It’s so liberating to know there’s a product to relieve the weekend culture feeding! The beads worked very well in my hands, I used for the last week end and did not observe any differentiation. StemBeads worked beautifully on our cells. After 1 month of culturing in Stembeads, the hESC colonies remained nice and undifferentiated, and even seemed to grow faster than in conventional hESC media with bFGF. It’s excellent that we no longer need to come in to change medium during the weekends. In my hands, StemBeads work very well, even when cells are cultured on matrigel in using TESR. I have been feeding my cells very 3 days, and the look at least as good, if not better than cells fed every day without StemBeads. This allows me to take care of more cell lines at once, and to spend more time doing things besides routine tissue culture. I am an Assistant Professor in Johns Hopkins University, School of Medicine. I have extensive experience of culturing human embryonic stem cells (hESCs) and human induced pluripotent stem cells (hiPSCs) more than 7 years now. Luckily my lab had a chance to test FGF2 Beads for maintaining hESCs and hiPSCs. FGF2- beads showed successful results. Whenever I met someone who wants to start any research with hESCs and hiPSCs, they are worrying about tissue culture. Indeed these cells need very special care. One of the issues is that these cells should be fed everyday, which compromises several things, including work hours during weekend and holiday season, wasting expensive culture media and increasing chances of contamination. But the FGF2-beads can solve these issues and should be very attractive choice for the researchers who are working on these particular cell types. 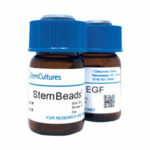 Stembeads FGF2 are stable with good quality, the beads gradually release FGF2 into the cell culture medium, which allow us to finish the assays in a 2-3 days timeframe without medium change. The StemBeads FGF2 worked really well in my hands. They allowed me to change the media every 3 or 4 days without any problems with differentiation. After a week and half of using StemBeads FGF2 I had beautiful plates of undifferentiated stem cells while using half the amount of media. This allowed me to spend more time doing important experiments and spend less money on expensive stem cell media.